Sony brings it’s first USB 3.0 flash memory drive-Micro Vault MACH. Micro Vault MACH is encased in sleek, solid aluminium body and sports a red indicator LED. It offers ultra-fast transfers up to 120 MB/s read / 90 MB/s write, backed by standard five-year warranty. The drives should be available later this month in 8GB, 16GB, 32GB and 64GB capacities. Read the full press release after the cut. Get ready for even faster saving, sharing and uploads of your personal media files. Brand-new Micro Vault MACH is the first family of flash memory drives from Sony with SuperSpeed USB 3.0 technology for blazing performance that won't slow you down. Micro Vault MACH is ideal for consumers and business users who need the convenience and reliability of ultra-fast on-the-go data transfers. Available in capacities from 8GB up to 64GB, Micro Vault MACH offers data speeds up to 120 MB/s (read) and 90 MB/s (write)*. You'll enjoy faster sharing and uploads of music, photos, HD video and media-rich documents – and less time spent waiting for your files to copy. Micro Vault MACH is backward-compatible with USB 2.0, so you can use it seamlessly with current PCs and other devices that don't support the SuperSpeed USB 3.0 standard. Micro Vault MACH is encased in sleek, solid aluminium body that's built to withstand day-to-day knocks. The retractable USB connector's click mechanism offers extra protection while shrinking the drive's size for even greater portability. There's a handy LED indicator to give visual confirmation of data transfers when the drive is in use. For extra peace for mind, all drives come with a standard five-year warranty. Downloadable software for Micro Vault MACH series includes File Rescue and x – Pict Story™. File rescue enables users to recover any important data that might have been deleted by mistake, making retrieving lost data such as images, movies and music files a breeze. The x – Pict Story™ software allows the creation of an automated photo presentation using the files stored on the Micro Vault. 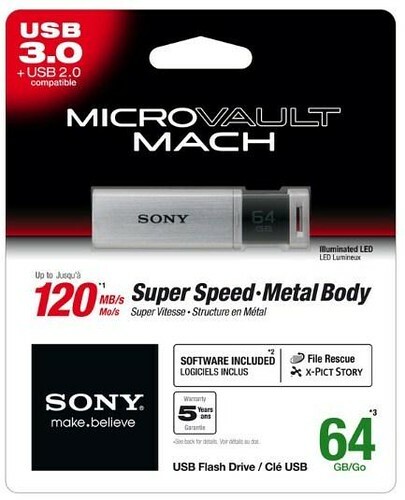 The new Micro Vault MACH series of USB 3.0 SuperSpeed flash memory drives by Sony is available from January 2012.